Happy spring, darlings! Just in time for the new season, I've finally finished Simplicity 1873. 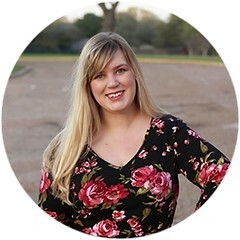 No worries, I did not drop off the sewing/blogging world. An unexpected trip and some unexpected sewing foibles just have me running a bit behind. You know how, sometimes, a project will try its best to kill you? Well, I don't know what I did to Cynthia Rowley, but she sent this pattern to do me in. If something could go wrong while sewing this up, it did. But - ha! - it's finished. It can torture me no more. You'll have to try harder to get this sewist to give up, Rowley. Okay, honestly, the issues were mostly my fault. Cynthia Rowley has designed another delightful pattern in 1873. As I've said previously, I'm not a huge fan of her ready-to-wear designs, but her sewing patterns work really well for me. (Witness the million iterations of Simplicity 2215.) This dress is no exception - the combination of that low scooped neckline and the full, pleated skirt makes me a bit weak in the knees. It's the epitome of my beloved fit-and-flare silhouettes. Right now, if I were forced to pick one dress from my closet to wear everyday for a year, this would be it. How's that for pattern love? Confident in Ms. Rowley's design, I chose a fabric I've been hoarding for awhile - a lovely, soft cotton eyelet from Gorgeous Fabrics. 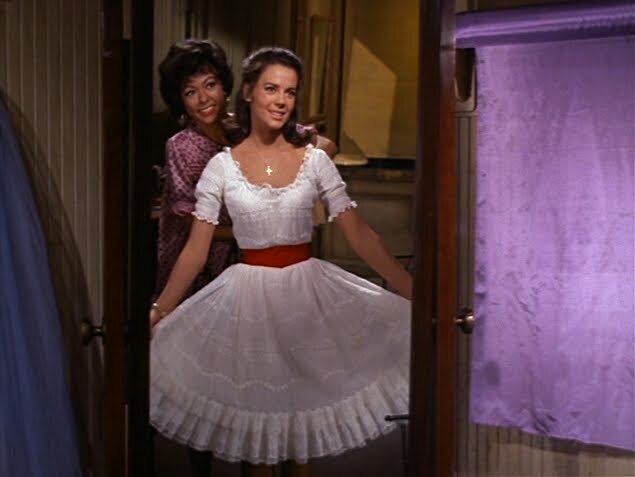 This summer, a sudden desperation to recreate Maria's dance dress from West Side Story overwhelmed me. This fabric was bought with that dress in mind. Of course, autumn came and it proceeded to sit in my closet for six months. When Simplicity released its spring patterns, however, 1873 demanded this fabric. The gentle lines suit eyelet so much, don't you think? The pattern only calls for a bodice lining, but this is eyelet. Obviously, a full lining was called for, unless I wanted to give my classmates an eyeful. So, a nice white linen from Hancock Fabrics was called to duty. Construction was, itself, a terror. I don't know what I was smoking when I cut out the fabric, but the skirt hem was a hot mess. Not a single piece of the five panel skirt (front panel, two side panels, and two back panels) was the same length. How does that even happen? I also, somehow, ended up with a wider bodice than skirt, which I suspect had something to do with my FBA. 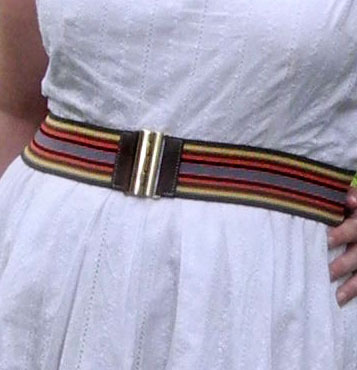 Luckily, the side seams are hidden between pleats anyway, so my waist finagling is invisible. Worse, however, were the sleeves. I know what you're thinking. What sleeves, Mary? Well, originally, I had cut out these darling little self-drafted cap sleeves. They were lovely and so very Maria! They were also too small by a good inch. I had forgotten to add seam allowances. My arms, they could not move. As lovely as it is to walk around with one's arms pasted to one's side, I ripped them out. Naturally, I hadn't realized they were too small until I'd sewn the damn things in. Brilliant, Mary, just brilliant. So, I then proceeded to stare at this dress for a week, debating the sleeves issue. Finally, I decided that I just couldn't face them again. Who cares what Maria's dress looked like? This was mine and it would be sleeveless! Sleeves? Who needs 'em? I've got a pink belt instead! The dress then sat for another two weeks, waiting for me to stop doing work, sewing a pencil skirt (which will make its debut later this week! ), and having unexpected travels, so I could hem it. Which, considering that wonky cutting job I did, looks pretty spectacular. There was barely enough length to raise it to the perfect just-above-my-knees spot. Of course, as soon as I finished, I loved it. Why did it take me so long to finish this dress? It's lovely. So springy! So versatile! Why, with just some black peep-toe pumps and sunglasses, it's even so very retro! Here's lookin' at you, kittens. The skirt! Is there anything so wonderful as a full, pleated skirt? Barring chocolate and puppies, of course, I can think of nothing. It just makes me want to swish! The eyelet! I am a bit of an eyelet hoarder, it must be said. I buy it, then hold it close, so I never mess it up. It's one of my favorite fabrics - so classic & feminine, which is my style crack. The scooped neckline! Perfect for necklaces and balancing out bodice proportions. Hooray! 2.5 inch Full Bust Adjustment, as ever. Added a full lining, rather than just the prescribed bodice lining. Nothing! The pattern is, itself, perfect. If I could change the sewist making this dress, I would. Sadly, no one else seems to be lining up to sew my clothes. I'll just have to fix my mistakes, next time around. The trickiest part of this pattern is the skirt pleating. It's a bit counter-intuitive, as the box pleats cover some of your seams. Don't worry! That's supposed to happen. For best of luck, clearly mark all those finicky little pleat lines, put on some Kimbra, and rock out while meticulously pleating yards of material. It will be worth it! Three weeks, or twelve hours, depending on how you count. 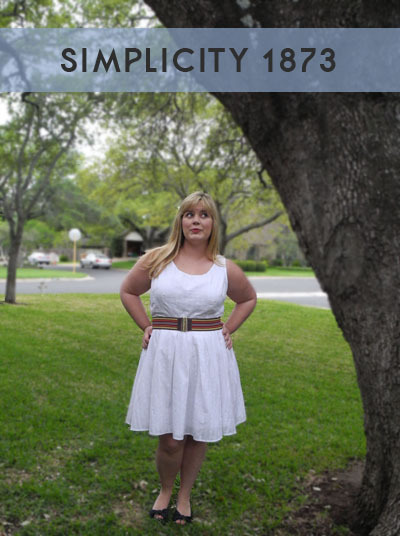 And my absolute favorite way to wear Simplicity 1873? With a cardigan, of course! Today I wore it with a mint green sweater, black belt, and black shoes...the perfect outfit for the first days of spring. I love it. Plain and simple (my love, not your dress!). I don't think I've looked twice at this pattern, the dress just looks so boxy on the envelope (as I find most of Cynthia Rowley patterns do). But it turned out beautiful! Thanks for opening my eyes to this pattern! Thank you so much, Heather! I'm so glad this changed your mind about the pattern. That envelope really didn't do it justice. The skirt on this dress just has so much motion. 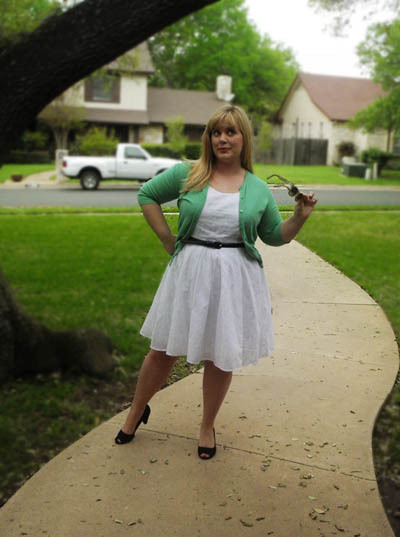 It's a joy to wear (and twirl in)! Don't you wish pattern companies would do a better job with envelopes? There are so many patterns I've sewn, which turned out infinitely better than the illustration had me believe. My biggest envelope pet peeve is when they use a print that hides the line of a garment. I love great fabric, but when buying a pattern I love a clear design better! Thanks, Maddie! I'm with you - eyelet and lace are my two favorites. There is a terrifyingly high pile of them both in my closet, waiting for me to brave using them. They really add something special to a garment. OOo you look uber cute with the cardi. Love mint green. Thanks a ton, T! Isn't mint green wonderful? It's one of my favorite colors to wear, hands down - especially with pops of black & white. It turned out spectacular!! 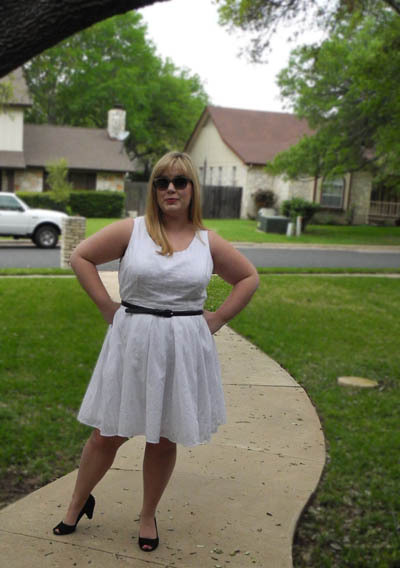 I just love a white dress for spring/summer. You look beautiful. Thank you so much, Sallie! Isn't white great for the warmer months? It makes me feel breezier, just slipping a white dress on. This dress looks wonderful and i love the fabric you chose! Thank you, Alexandra! I'm so glad you like it! Thanks, Angie! 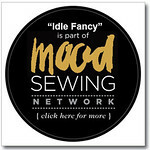 Aren't sewing foibles the worst? I hate having all sorts of motivation, only to flounder in the face of a difficult project. It's the worst. Oh, Rebecca, I can't wait to see your 1873! I'm so sorry to hear you're also having troubles with this pattern, though. The bodice and skirt just don't seem to fit as well as they should, don't they? All that pleating just muddles things a bit. Ugh. I hope it starts going easier for you! I have been eyeing that pattern! Looks like I need to make a trip to pick it up with a some fabric! Ren, this is a wonderful pattern! The finished project is definitely worth whatever headaches I had making it. I can't wait to see more of these on blogs! Thanks so much, Chrys! Isn't it great with mint? I love that color combination - this cardigan, by far, gets the most wear in my wardrobe. Just gorgeous! I love the eyelet. you look like spring to me and it's so exciting. the dress is adorable! Thanks, Kelli! Don't you love that we can finally start sewing for spring? There is nothing so refreshing to make as breezy spring garments. Well, the dress may have tried to kill you but it came out looking fantastic! Well done! I love this!! It looks lovely as a sleeveless dress, and I am a big fan of your eyelet fabric choice. Pairing it with the mint cardi and black accessories is totally classic - I love the whole ensemble! Thank you so much, Meg! Isn't the mint great with white & black? That's one of my favorite color combinations, for sure. It makes me feel so fifties! Thank you, Melanie! I'm so, so glad you like it! White with spring colors really is such a fantastic combination, isn't it? I feel cheerier just wearing them together. Beautiful, Beautiful, Beautiful!! I love this! It's perfect for spring and summer, it's versatile, you look fantastic in it, and the fabric is gorgeous. I was drooling over this pattern and for some (inexplicable) reason didn't pick it up. It's on the list now! Fit-and-flare dresses are my favorite! I picked this pattern up because Hobby Lobby has Simplicity patterns for 99 cents this week. I figured, why not? We'll see how it goes. any help/hints would be appreciated. I am so glad I found your blog. It is helpful and inspiring for me to see a fellow sewist with a curvier figure so I can get a better idea of how some patterns would turn out on myself. Keep it up, I love what you are doing! So cute and classic in white :-) you look wonderful!